Cauliflower has been an “it” vegetable for years. And why not? It’s flavorful and nutritious, and works well in lots of dishes. We particularly like to marinate cooked cauliflower in olive oil and vinegar, then serve it as a salad. Adding capers gives it tang. Tossing in some parsley and pimento ups the flavor and color. Best of all, you can make this salad ahead of time. So it’s perfect for entertaining – no last-minute rush to get that first course on the table. This dish, or variations of it, can be found on the menu in many Mediterranean countries, particularly Italy. It’s a flexible recipe – you can substitute or eliminate ingredients. And exact quantities aren’t critical. We adapted this recipe from one we saw in the New York Times about a decade ago. For this post, we boiled the cauliflower. But you could also steam or microwave it. We haven’t made this dish with Roast Cauliflower, but that probably would work too. Prep time for this dish is about 15 minutes. Then the cooked cauliflower needs to marinate for at least half an hour. We usually make this salad several hours before serving, which allows the dressing plenty of time to soak in. You can make it up to a day ahead (but don’t add the parsley until right before serving; otherwise it will discolor). This recipe makes 4 generous (or 6 less generous) servings. Leftovers keep for a day or two if refrigerated. Bring a large pot of water to boil on the stovetop. While waiting for the water to heat, rinse the cauliflower, core it, and cut or break it into florets. When the water reaches boiling, add salt to season it. Add the cauliflower pieces and cook until they’re tender (5 minutes or so). Drain the cauliflower and shock it in a large basin of iced water to stop the cooking. After 5 minutes, drain the cauliflower and let it dry for about 10 minutes. Place the cauliflower pieces in a large mixing bowl. Peel and mince the garlic. Add the chopped garlic to the cauliflower. Drain and rinse the capers and pimento, then add them to the cauliflower. Add the vinegar and olive oil to the cauliflower, then mix thoroughly. Add salt and black pepper to taste. Let the cauliflower marinate for at least 30 minutes, or even overnight (place in an airtight container in the refrigerator). Bring the cauliflower mixture to room temperature before serving. Right before serving, wash the parsley and mince it, then mix it with the cauliflower. You probably could add cooked white beans to this dish and make it a main-course salad. We haven’t tried this, but it sounds tasty. We use jarred pimentos because they add flavor and color. You could substitute diced, fresh red bell pepper if you prefer. Some other additions you might want to try: Diced celery or scallions, or maybe mushrooms. If you add extras to the salad, you’ll probably want to increase the amount of vinegar and oil in the dressing. We like to use a mild white-wine or champagne vinegar in this dish, but red-wine vinegar should work in a pinch. Lemon juice is good, too. Olive oil plays a fairly prominent role in this recipe, so use something of good quality. The higher quality the olive oil, the better the salad will be. We use kosher salt in cooking, which is less salty by volume than regular table salt (its flakes are larger, so they don’t pack as densely in a measure). If using regular table salt, start with about half as much as we suggest. But, as always, season to your taste, not ours. It’s highly likely that you’ll want to use different amounts of salt and pepper than we do. That’s Mrs K R’s motto: Caper Diem. Cauliflower is one of my top favourite veggies. This is such a fun way to prepare cauliflowers! Hi Angie, you'll love this dish! It has TONS of flavor. :-) Thanks for the comment. Isn't if funny how such a humble vegetable can be so incredibly popular? This is one of my favorite ways to eat cauliflower. I can never get enough and it disappears way too quickly. My love for capers is real. And I love cauliflower almost as much! This salad sound fantastic! Hi Dahn, I really didn't like cauliflower when I was a kid, but now it's one of my favorites. And this is a wonderful way to prepare it -- TONS of flavor. :-) Thanks for the comment. Hi Kelsie, capers are a wonderful ingredient, aren't they? They combine so well with cauliflower, too. :-) Thanks for the comment. If only I could get my husband to like cauliflower. Maybe this recipe will do the trick! Hi Pam, maybe! Otherwise,more for you. :-) Thanks for the comment. Make ahead recipes get me through the week. I have days when I am too busy too cook and others when I have the luxury of spending time in the kitchen. The recipe for marinated cauliflower would be a huge flavor boost to our weeknight salads! 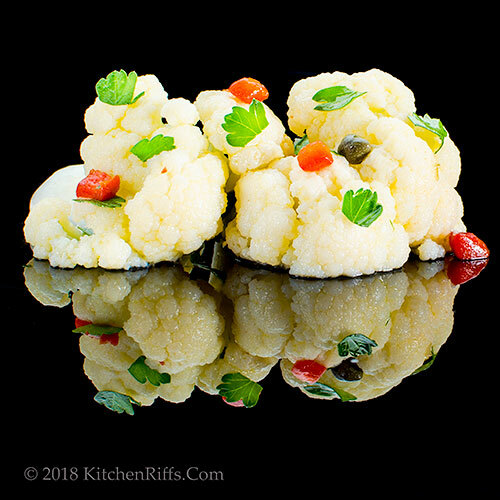 Giardiniera is another very similar Italian appetizer salad that I quite love -- main difference is that it's marinated for a week instead of an hour. Carrots as well as cauliflower and other veggies are in it, sometimes tuna too. But there are many variations and all GOOD! Cauliflower is one of my favorite vegetables. I actually love the idea of using roasted cauliflower here - the difference in texture and complex flavor would really be something. Hi Deb, we love recipes we can make ahead, too. And this is a good one! :-) Thanks for the comment. Hi Mae, you're right: Giardiniera is a close cousin (maybe even a sibling) of this dish! Thanks for the comment. Hi Laura, we haven't tried this with roasted cauliflower, but agree it should really work well. :-) Thanks for the comment. Hi Barbara, growing up does have advantages. :-) I hated cauliflower as a kid, too, but love it now. Thanks for the comment. I’m at pickleball sitting out and shouldn’t be reading recipes as I skipped dinner!! This sounds delish and I have some home cooked channeling beans I’ll have to add. Great idea ! Now if I could just get out of this pickle I could be pickling something tasty!! 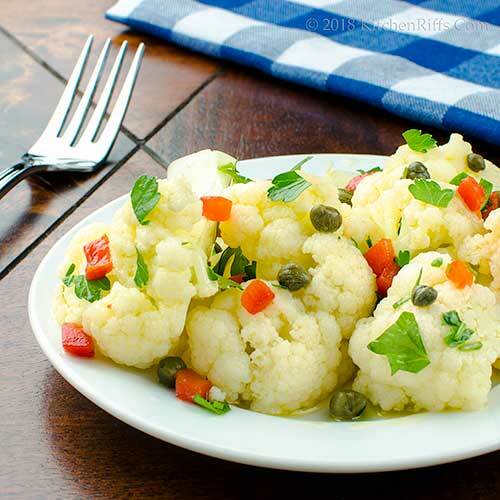 This is definitely a recipe for me, a not so crazy cauliflower eater who likes to find fun ways to make it a want veggie :-) Love the flavors, the added capers, and like the idea of adding white beans. Thanks! Hi Merryn, simple is us. :-) Thanks for the comment. Hi Susan, yeah, you're in a different sort of pickle at the moment. :-) Thanks for the comment. Hi Evelyne, everyone who has tasted this has loved it! Really a good dish. :-) Thanks for the comment. I love cauliflower. This dish sounds yummy. I need to try this recipe. Hi Dawn, you DO need to try this! :-) Thanks for the comment. I am always trying to find new ways to incorporate cauli in my meals and I am totally in love with this salad. Hi Taruna, you'll really like this -- nice, tangy flavor. :-) Thanks for the comment. I love this salad , it reminds me of pickled vegetables. THIS IS MY KIND OF SALAD! 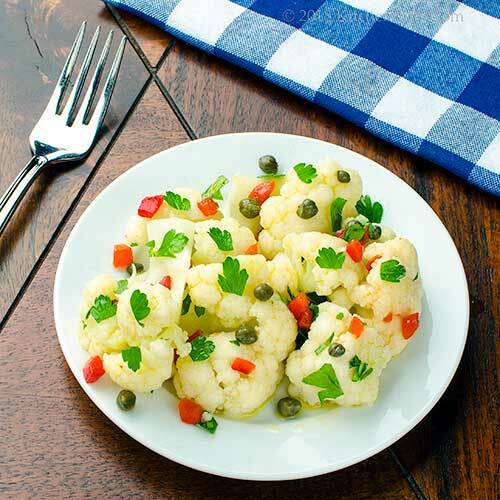 Love cauliflower and LOVEEE CAPERS! Cauliflower doesn't REALLLLLLYYYYYY love me back, if you catch my... Wind? LMFAO - but OHHHH WELL! Hi Gerlinde, it is rather like pickled veggies, isn't it? :-) Thanks for the comment. Hi GiGi, yup, get your drift. :-) Worth a bit of discomfort though -- this tastes SO GOOD! Thanks for the comment. John, we're going to love this! Can't wait to pick up a cauliflower and get the capers out! Hi Jean, it's a terrific dish -- enjoy! :-) Thanks for the comment. So simple to make yet low-carb and I bet tasty too. Hi Denise, really tasty! :-) Thanks for the comment. Hi Greg, he must have! :-) Thanks for the commnt. I love this! This post made me remember that I used to marinate raw vegetables for hors d’oeuvres, and I hadn’t thought about them for a long time. So at first I thought you’d marinated raw cauliflower! Well of course not. This is wonderful and I love the capers. We get wrapped up in our boring (but favorite) steamed cauliflower dish all the time. I will have to change it up and give this a try - it sounds wonderful! Hi Mimi, you could probably marinate the cauliflower when raw,but when cooked it absorbs so much more flavor. Really good stuff. :-) Thanks for the comment. Hi Tricia, it's easy to make the same (good!) thing all the time. But this is a wonderful change-of-pace! Thanks for the comment. Hi Amira, sometimes simple is best. :-) Thanks for the comment. 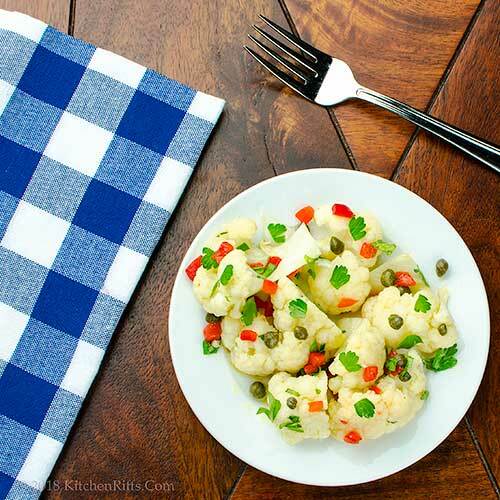 Cauliflower and capers are two of my favorite things! I'm guessing that I would love this! Hi Abbe, bet you would love it! :-) Thanks for the comment. I make something very much like this for Christmas, but it's too good to limit to one time of year. Great stuff and like you said, healthy, too. Hi Frank, this really has fantastic flavor. And really healthy, as you say. Thanks for the comment. Hi Charlie, isn't cauliflower wonderful? Hope you have a bumper crop. So you can make lots of this. :-) Good to see you, and thanks for the comment. This looks tasty - I love cauliflower. Hi Amalia, cauliflower is good, isn't it? And so nice in this recipe! Thanks for the comment. I always keep a jar of capers in the fridge. Their salty pop really wakes up so many dishes. This one looks to be a new spring favorite, too. Hi Carolyn, we usually have capers in the refrigerator, too. A little go a long way! :-) Thanks for the ocmment. We have a house of pickle lovers! They will be swooning over this easy and delicious recipe. Hi Bobbi, your pickle lovers will, well, love this. :-) Thanks for the comment. Wow - this is a super unique and interesting salad! Hi Amy, it's really good, too! :-) Thanks for the comment. You really have piqued my curiosity with this one! Have never seen cauliflower served like this - cold as a salad and somewhat pickled. Love that idea and might just be one of the few ways that B and I could learn to like cauliflower. :) Thanks John! Hi MJ, it's a neat dish -- loaded with flavor. :-) Thanks for the comment. John, I love cauliflower and I enjoy chilled vegetable salads like this (especially during our brutal summers!) I've bookmarked this recipe and I seriously can't wait to make it! It looks delicious! Hi Marcelle, bet you'll love this! It has wonderful flavor. :-) Thanks for the comment. I so want to try this with roasted cauliflower like you mention. I also adore capers!!!! Win-win!!!! Hi Debra, we really need to get around to trying this with roasted cauliflower -- sounds so nice, doesn't it? Thanks for the comment. Carpe Diem- Seize the day! One of my favorite expressions.This salad would certainly make you wake up in the morning and want to seize the day! A new way to enjoy cauliflower! I'm all in, especially when capers are involved! Hi Fran, it does, doesn't it? :-) Thanks for the comment. Hi Liz, capers add so much zing, don't they? Love them! Thanks for the comment. Hi Emma, you'll LOVE this! Really full of flavor. :-) Thanks for the comment.